In any inventive design it's important to realise that one does not necessarily have to adhere to a single theme or aesthetic throughout the home, rather an amalgamation of contrasting elements might be better suited to added colour and character. 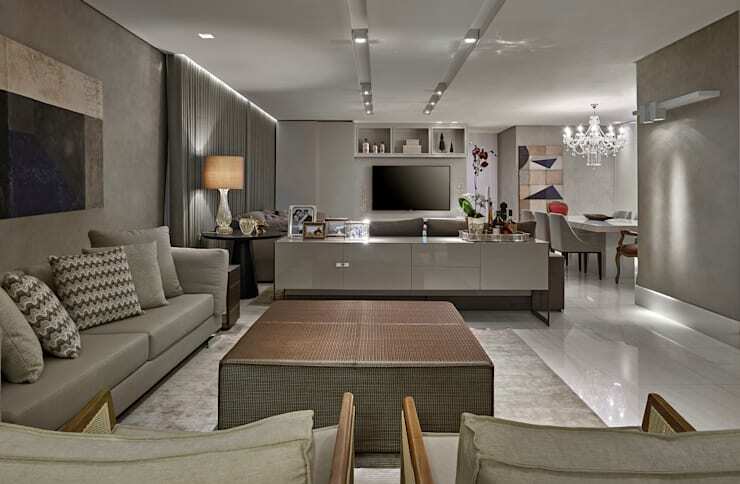 This fabulous, Brazilian apartment does just that, bringing together classic and contemporary decor and furnishings throughout its expansive plan, and then adding an Asian influence through the inclusion of a range of unique, decorative objects. 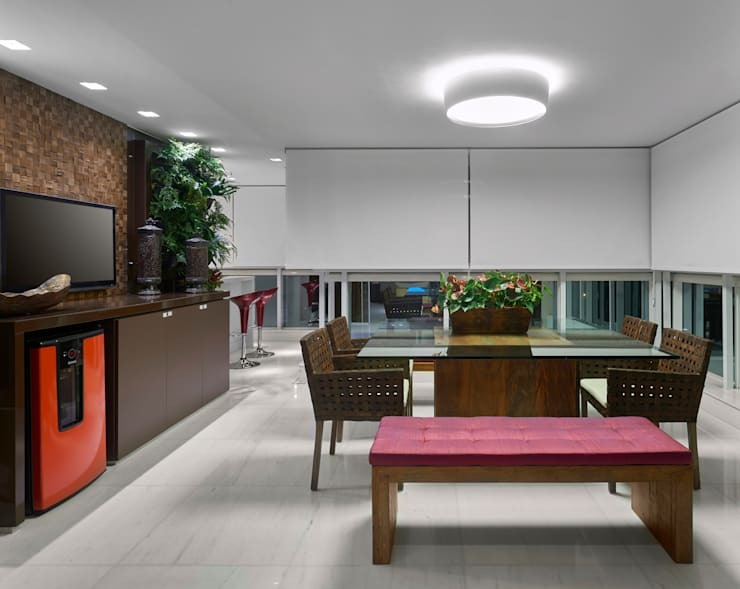 Born of the creative genius of Isabela Canaan Arquitetos, the home is immediately inviting in style and sophistication. The living quarters are generously proportioned and include areas for both formal and casual living and dining. The formal dining setting is truly exceptional, beautifully blending classic elements such as a crystal chandelier and vintage armchairs with geometric, contemporary artwork and a sleek, minimalistic table. As we shift through the house however, we notice that an Asian aesthetic begin to subtly materialise. Striking reds and blacks evoke a classic Chinese colour scheme, while patterned, silver artefacts and wooden sculptures hailing from South East Asia decorate various spaces within the home. The effect is surprising and engaging, with these decorative elements adding a deeper sense of character to the apartment, which still retains an overarching air of modern luxury and style. The entrance to the home appears palatial and inviting, exuding luxury and a touch of familial charm. The living quarters are modern in design, with contemporary furnishings combined with a subdued colour scheme to create a sophisticated atmosphere. The expansive space in the foreground presents an area for entertaining and relaxing with large groups, while a smaller living area can be seen in the distance, presenting a relaxed vantage from which to enjoy the television. A dining setting has been included adjacent to the smaller living area, providing an elegant, formal space to host stylish dinners. The smaller, more relaxed living area within the home still appears spacious and inviting. 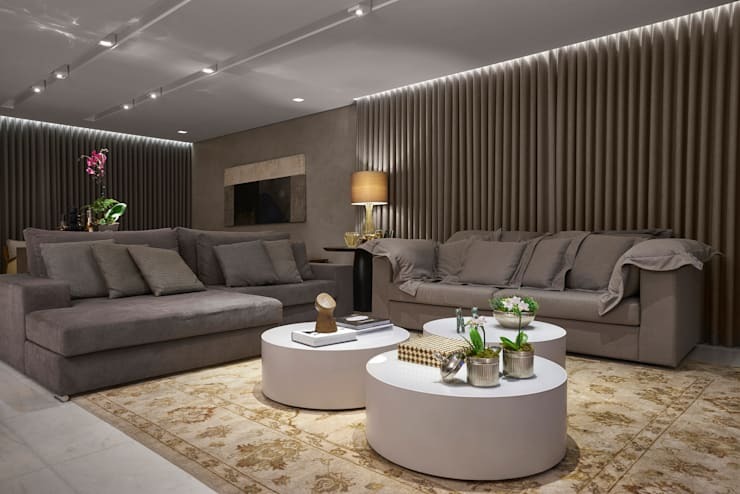 The softer feel of the lounge suite and more casual design of the round coffee tables seen here provide the primary stylistic contrast between this space and its predecessor. A large stretch of windows borders the area, covered in a thick curtain which complements the prevailing colour scheme within the living rooms, while the golden tones of a vintage-style rug and a smattering of vibrant decorative objects provide a colour contrast in the space. This view of the dining area presents the space in glorious elegance, with its simple table and stylish chairs oozing opulence and luxury. 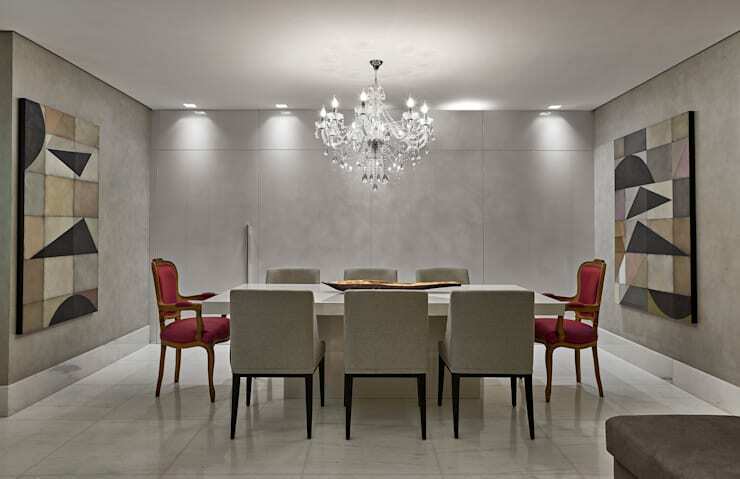 Twin, red armchairs head the dining table, adding a palatial feel to the setting alongside the crystal chandelier hanging overhead. The decor within the room has been designed with subdued tones and sleek finishes, and two geometric, contemporary artworks adorn the walls, presenting a stylistic contrast to the classic armchairs and chandelier. Moving through the home and we can see that a casual dining area has also been included in a more vibrant colour scheme that the formal area seen previously. Bordered by an expanse of large windows, this setting is spacious and stylish. A grand, square dining table in wood and glass is the centrepiece of the room, while the bright red of a wine fridge and a sleek, modern television set the scene for entertainment. This space also introduces the home's Asian-infusion, with the raw silk upholstery of a simple, wooden bench and traditional artefacts displayed on the brown cabinets adding a sense of Asian style within the home. Designed for casual interaction, this small space presents another exampled of the flourishing infusion of an Asian aesthetic within the home. The space appears cosy and rustic, with the influence of Asian style seen in the striking red and black of the shelving units and the decorative objects displayed therein. 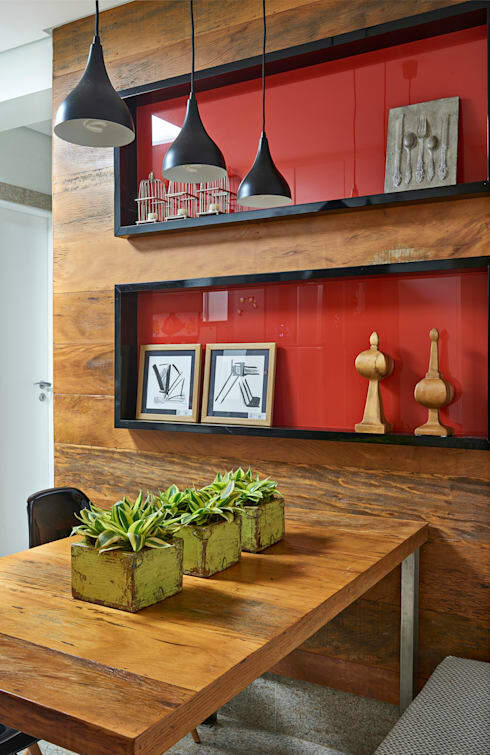 The rough timber of the wall and the three, rustic flower boxes presented on the table add a contrast to the sleek, contemporary finishes characterising the remainder of the home, augmenting the casual feel of this area. 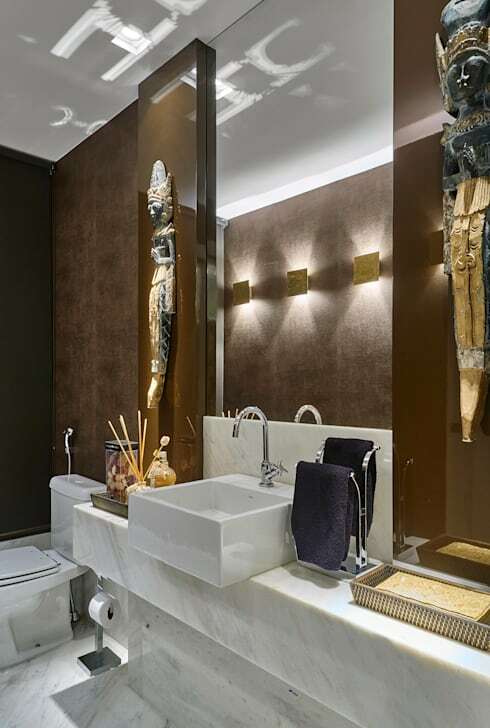 The bathroom presents a striking aesthetic, with its marble floor and sink unit providing a luxurious foundation upon which to base the engaging combination of textured brown walls and Asian-style statues. A large mirror elongates the space, and reflects the soft glow of mounted lamps, which beautifully illuminate the gold and black of the intriguing statues. 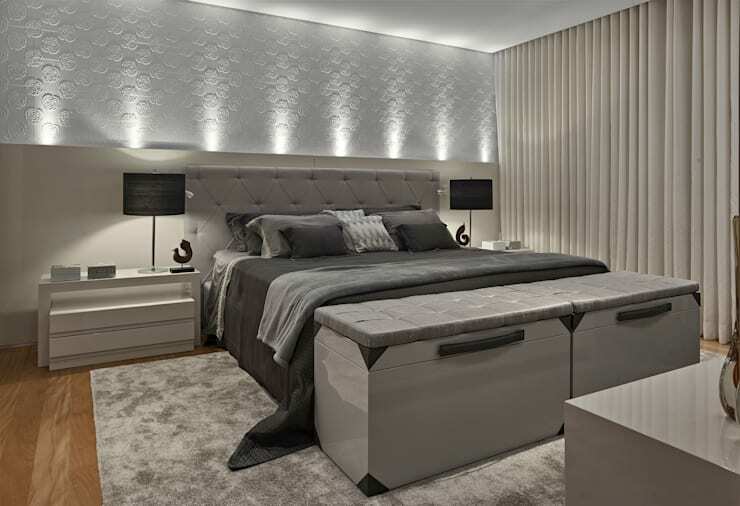 The master bedroom of the home is stunning and subdued in cool, grey tones. The king sized bed sits in elegant luxury, with its grey and black tones complemented by a quilted bed head and the raw silk trim of the two storage trunks at its feet. The remainder of the room has been dressed in simple style. The bedside tables have been kept streamlined and contemporary and the soft shag of a silver rug adds a textural contrast to the space, alongside the floral pattern of the room's white walls and expansive, flowing curtains. For more ideas on how to infuse a strong cultural characteristic within your abode have a look at The African-Inspired Home! What do you think of the colour scheme in this wonderful apartment? Can you imagine living here? Let us know in the comments!